Wayne enters Elbow Reef Lighthouse. 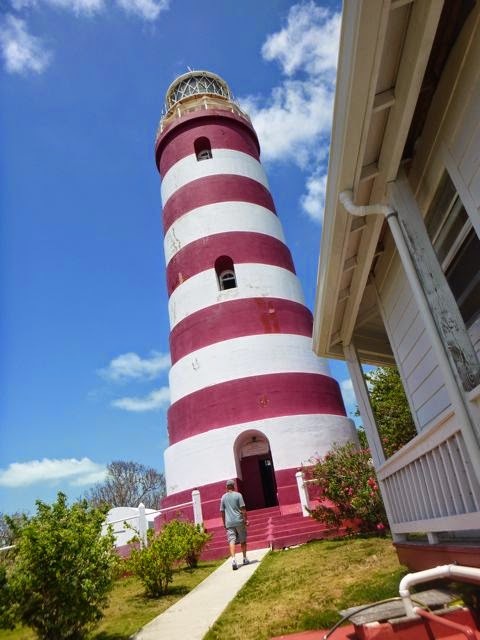 If there’s only one image to show of picturesque, well-heeled Hope Town in Abacos, BAHAMAS it’s tough to beat their iconic, sprightly candy-cane colored Elbow Reef Lighthouse. 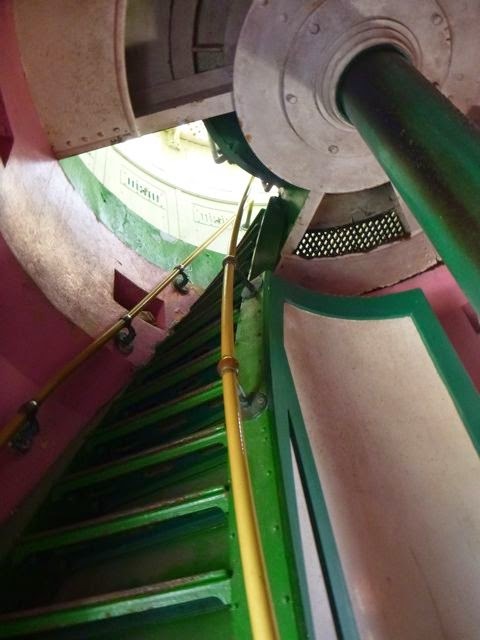 Celebrating its 150th anniversary this year, the lighthouse’s history is even more colorful that its appearance. In their heyday, would you believe lighthouses decimated the largest business at the time in the BAHAMAS? 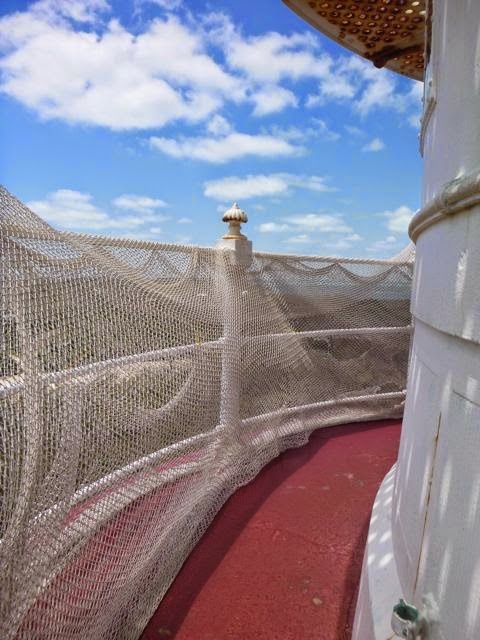 Hannah Solo and Neal Aberle’s Lighthouse article, with quotations of their interview with David Gale of the Bahamas Lighthouse Preservation Society (click here to access their Lighthouse article) tells the tale…. Walking to Elbow Reef Lighthouse. While operating well within the law and even amply supporting the treasury, Wrackers strike me as legally sanctioned pirates. 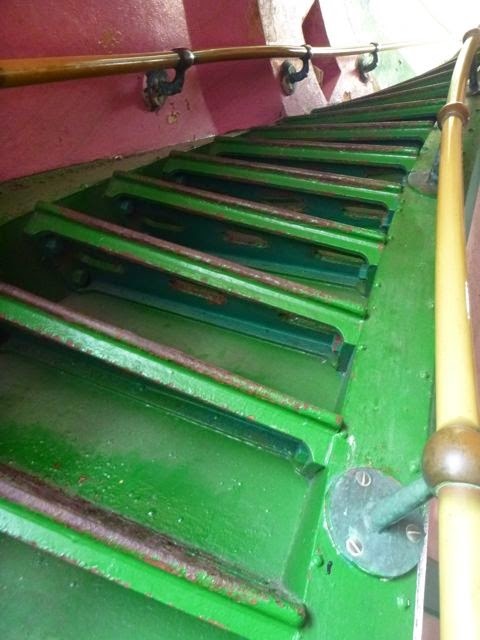 Steepening stairs at Elbow Reef Lighthouse. Despite the protests, the lighthouse was completed in 1864. 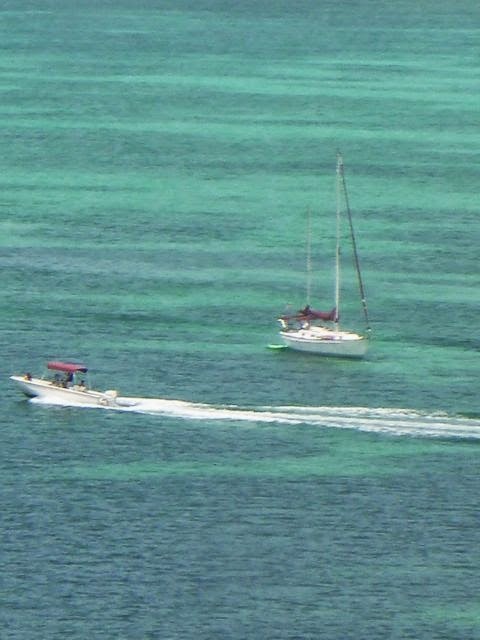 Best view in the Abacos from Elbow Reef Lighthouse. The original lens cast a fixed, unflashing beam (according to Visit Hopetown’s website – click here for that). 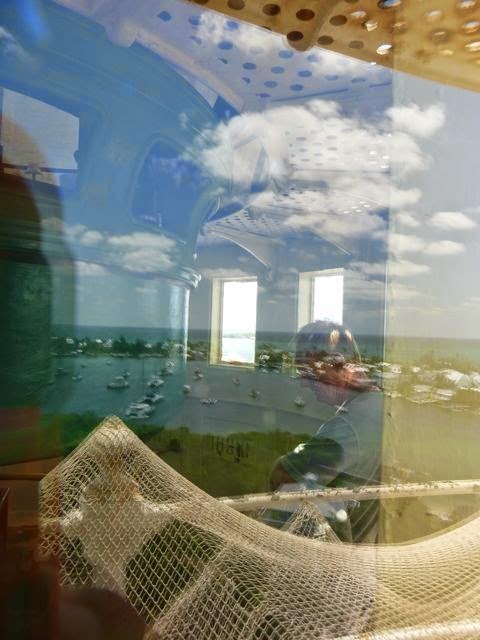 In 1936 when the Gun Cay lighthouse (south of Bimini) was decommissioned, its iron lantern room with its dome, petroleum burner equipment, turning mechanism, and the rotating Fresnel lenticular panels were installed in the Elbow Reef Lighthouse. The new beacon provided easier identification by ships in the Hopetown area, visible as far as 15 nautical miles at sea. Like the BAHAMAS Great Inagua Lighthouse (click here for my post on that), these lighthouses are the three remaining hand-wound kerosene–burning lighthouses in the world (according to David Gale -- click here for his Hopetown Lighthouse History post); the third is on BAHAMAS San Salvador, which we wanted to visit, but the prevailing winds made other plans for us. “Every two hours the keeper on duty has to wind, to the top of the tower, seven hundred pounds of weight by means of a hand winch. 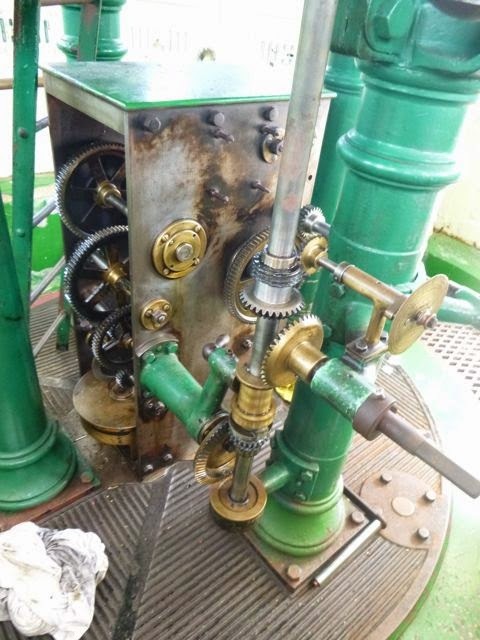 The descending weights, through a series of bronze gears, rotate the four-ton apparatus once around every 15 seconds -- and very smoothly, at that,” explains Gale. Today, the Elbow Reef Lighthouse is still sending out light, rated at 325,000 candlepower. 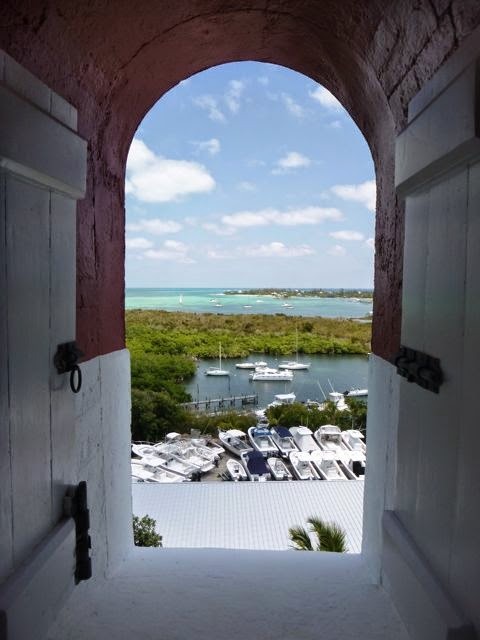 History aside, it’s well worth climbing the increasingly steep set of 100+ stairs to enjoy the best viewpoint in the Abacos. Even non-gearheads like me are captivated by the sheer beauty of the eFresnel lenses and attendant mechanisms. The lighthouse is open daily, and free. 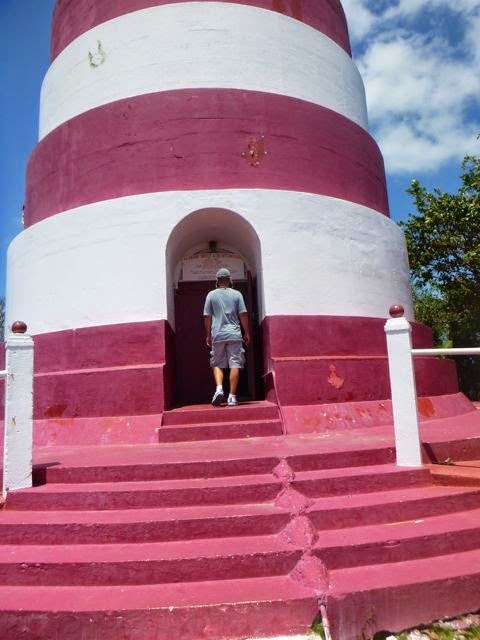 If you’d like to help support the cost of preserving this treasure, donations are accepted at the lighthouse or you can click here to contact the Bahamas Lighthouse Preservation Society. We are currently working over hurricane season in Jacksonville FL; this time with our boat “on the hard” in Green Cove Springs, until just before we leave in November, bound for the South Pacific via the Panama Canal. There’s still lots of retrospectives coming up, plus how we’ll plan for long ocean passages.